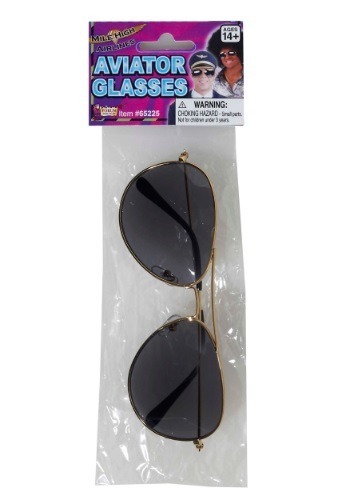 Whether you are riding your hog down the highway, or flying in an F-14 Tomcat, you need to keep the sun's harmful rays out of your eyes. Sure sometimes you can wear a baseball hat, the brim shielding your precious peepers. But what about when you are dancing in a field listening to some groovy tunes with a few thousand of your closest friends? A hat wont be able to do the job good enough. Only these Aviator Sunglasses can do the job right. They will stop the sun, and the wind from getting in your eyes when you are driving down the highway on your motorcycle. And they are the only things that are going to stop the blinding sun once you get a mile above the earths surface. They won't even fall off as you sway back and forth, in time to the Grateful Dead's Touch of Grey. The nose rest piece was missing on the one side. Costume or not, provides fun in the sun for a run or a chill on a hill laying still.